International Music Composition Competition (BIMCC). After months of preparation, 20 composers from all over the world are heading to Banaue to see the world-famous Banaue Rice Terraces for the first-ever BIMCC. The 10-day immersion trip is meant to showcase the Ifugao culture and bring their issues closer to the composers for their deeper appreciation and understanding. “The Banaue Rice Terraces is more than just a breathtaking view. It is home for a community fueled by their culture,” stated General Jaime de los Santos, Project Manager of the Banaue Rice Terraces Restoration Project. “The area has faced a host of challenges in recent years, and we aim to bring it back to its full glory through the Banaue Rice Terraces Restoration Project. We recognize that there is much work to be done and what we’re doing is just a start. Through BIMCC, we want to call attention to the scale of the challenge and how the public can show support through a celebration of music and culture. ” The competition called for Banaue-inspired symphonic compositions and received an overwhelming response from composers all over the world, generating 84 entries. 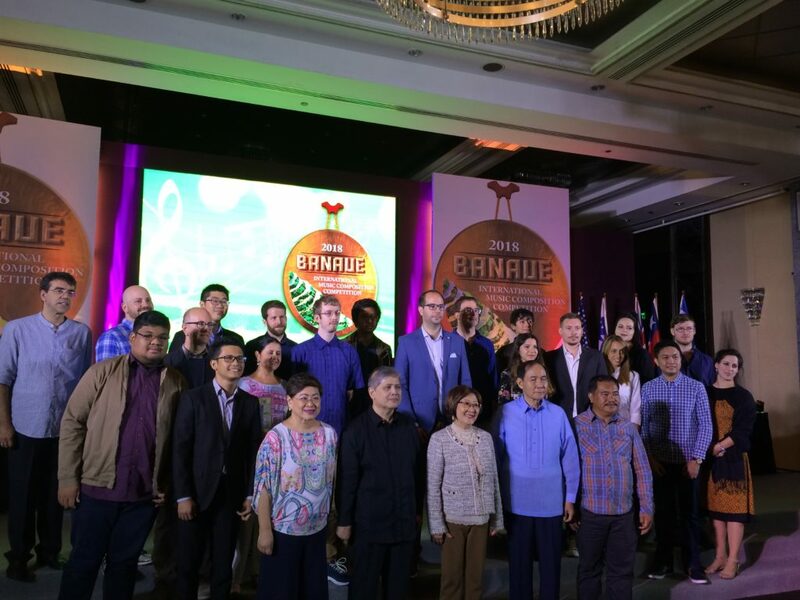 Following screenings and deliberations, 20 composers were chosen to go on an immersion program in Banaue, where the top 10 finalists will be chosen at the semi-finals to be held at the Banaue Hotel. The chosen pieces will then be performed by an orchestra at the Grand Finals Night at the Tanghalang Nicanor Abelardo at the Cultural Center of the Philippines on July 25,2018. “Through music, we are sending a strong message to the public and the world about the beauty and culture of the Banaue Rice Terraces. We hope to draw out attention from Filipinos to help restore our famous World Heritage site and the ecosystem that thrives in and around it,” shared BIMCC Artistic Director Professor Chino Toledo. “All the Banaue-inspired compositions that we received from composers from all over the world signify how different cultures can relate to and work on a common goal of preserving an international treasure, as well as the diversity and rich heritage surrounding it,” added Toledo. Helping out Filipino farmers and the agriculture sector has been a longtime advocacy of Universal Harvester, Incorporated (UHI). UHI President and CEO Dr. Milagros O. How. “Our work on the Banaue Rice Terraces Restoration Project also calls attention to the need for greater support to the agricultural sector. UHI formed our advocacy arm under TOFARM to push for the advancement of the Philippine agriculture and to recognize farmers as the country’s heroes. Through these activities, not only are we unlocking potentials and boosting productivity, but also preserving our heritage as Filipinos,” explained Dr. Ong-How. range from Php1,000 to Php5,000. Proceeds from the event will be used for the benefit of the projects to rehabilitate and restore the rice terraces starting at the Barangay View Point,Banaue, Ifugao.